“VictorCiz” is a musical artist born in sapele, Delta state. His real name is Victor Oluchi Chimuya, from aniocha south local government Asaba, Delta state. After holding down a place in the Delta State Music Industry, VictorCiz decided to relocate to Lagos State. VictorCiz has been performing in some areas and different places in Nigeria and also in Accra Ghana where he is currently making waves. 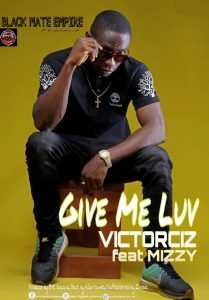 In his quest not to let his fans and supporters down, VictorCiz has been delivering good vibes every moment and here is his latest Afro Dancehall song titled “Give Me Luv”. This song was Produced by BlackMateEmpire, Beat by Killertunes, Mixed & Mastered by Zinobiz. Posted by Mr. Cis on November 17, 2018.